What is the ProAdvisor Program? The ProAdvisor Program enables accounting pros to grow their firm, skills and QuickBooks expertise by providing benefits including training, customer care, strategic marketing tools, and accountant specific product discounts. To learn more about the ProAdvisor Program, click here. How do I join the ProAdvisor Program? 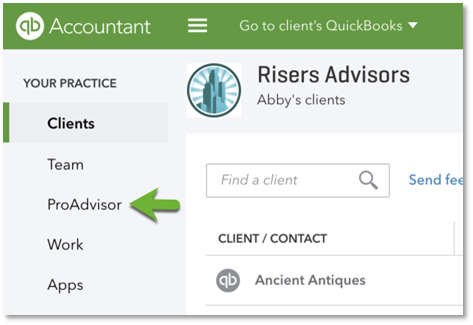 The ProAdvisor Program is available for free to all accounting pros using QuickBooks Online Accountant. When you create a QBOA login account, you will belong under a QuickBooks Accountant (QBA) firm and you will automatically be enrolled under the QBA firm’s ProAdvisor Program account. Each QBA firm has its own ProAdvisor Program account. To access the program, log into QBOA and go to the ProAdvisor tab on the left-hand side. Sign up for free today. Am I eligible for the ProAdvisor Program? If you have a QuickBooks Online Accountant (QBOA) account, you are eligible to participate in the ProAdvisor Program. Go to the ProAdvisor tab in QBOA to access your tier, benefits, training and certification and much more. What else changed in the program? We’ve updated several components of the program, with a focus on more benefits, ways to earn new points-based structure, and an improved in-product experience. For a complete overview, please read through our Firm of the Future blog. Why did Intuit make changes to the ProAdvisor Program? Over the last year and a half, we’ve invested heavily in listening to member feedback, struggles accountants face in growing their business, and global accounting industry trends. The redesigned program provides the most requested benefits by members to help them grow their firm and expertise. Why am I no longer a Diamond ProAdvisor? We've updated the new program from three tiers to four tiers. The Diamond tier is now called Platinum with the same plus new additional benefits to enjoy. What is the Elite Tier? We’ve expanded to four tiers to better recognize and reward our top accounting pros. We’re excited to announce the Elite tier, an entirely new tier with new benefits to power your firm’s growth. How do I achieve each tier? The new point system was crafted to recognize the work you do and give you more flexibility in moving up the tiers and unlocking new benefits. Points are accumulated based on all members in the same QBA firm through the completion of actions (see list below). For full details about how to earn, see our Firm of the Future blog. You can see your point balance anytime by logging into QuickBooks Online Accountant and accessing the ProAdvisor tab. Points will expire from your balance when the action that earned them is no longer valid. For example, if you have 50 points for an attached QuickBooks Online account, and that account is deleted, then those 50 points will be deducted from the point balance. How are my points calculated for my Desktop Certification? Your QBA firm receives 100 points for every member holding a current Desktop certification. If your QBA firm has 5 members holding the most recent certification then the firm will have 500 points. Available certifications can be found inside QuickBooks Online Accountant Proadvisor > Training. What point options can I earn for supporting QuickBooks Desktop? All point earning opportunities are open to all of our accounting pros. 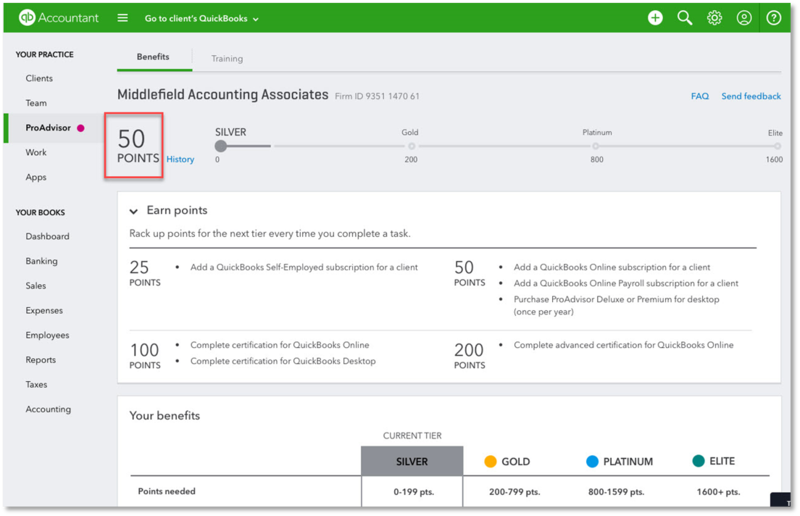 There are two opportunities tied specifically to the Desktop product; QuickBooks Desktop Certification (100 points per member) and purchasing the ProAdvisor software bundle (one per firm). Do I get points for purchasing the Desktop ProAdvisor Bundle (Deluxe or Premium)? Absolutely! Your firm will receive 100 points for one purchase of the Desktop ProAdvisor Software Bundle (Deluxe or Premium). The bundle can be purchased by calling our sales team at 800-450-8475 or by visiting our ProAdvisor website. A grace period will keep you in the same tier without losing benefits anytime your QBA firm’s point balance drops below the tier threshold. The grace period gives you time to earn enough points to maintain the tier. If the points balance at the end of the grace period do not meet the threshold for the tier, you and all members of the same QBA firm will be moved to the lower tier. Why do I have 90 days to try benefits starting November 28, 2018 when the program launches? For the redesigned ProAdvisor program launch, you have days starting November 28, 2018 to try the benefits at the tier you see on your ProAdvisor Dashboard. Your point balance at the end of the 90 days will determine the tier you stay in. Your point balance and tier will update real time as you continue to complete actions and earn points. What is the 3 year grace period for my Advanced Certification (either Desktop or Online)? To recognize the work you’ve put in for earning an Advanced Certification in either Desktop or Online, we’re guaranteeing you three years in the Platinum tier, which replaced the old Diamond tier. * For the next three years you will have full access to all the benefits of the Platinum tier. At the end of the three years, you will need a point balance of 800 to remain in Platinum, or you will be moved to the lower tier. *Please note that for Online Advanced Certification, the 3 year grace period starts on November 28, 2018. For Desktop Advanced Certification, the 3 year grace period starts on January 1, 2019. I have an active QuickBooks Online Certification, what is my grace period? If the highest certification in a QBA firm is QuickBooks Online Certification, you will have full access to all the benefits of the Gold tier. At the end of the 6 months, you will need a point balance of 200 to remain in Gold, or you will be moved to the lower tier. What is the grace period when the point balance falls under a tier point requirement? There is a standard 90-day grace period for all tier drops. Note this standard grace period is activated after the other certification grace periods have expired. At any time the point balance falls under the tier point requirement, you and all members of the same QBA firm will have 90 days to earn enough points to remain in the tier. During the 90-day grace period, you will continue to full access to the benefits in the tier. If the points balance at the end of the grace period do not meet the threshold for the tier, you and all members of the same QBA firm will be moved to the lower tier. What are the benefits of the new ProAdvisor Program? A full list of new, exclusive ProAdvisor benefits can be found here. Your benefits can be accessed at any time by logging into QuickBooks Online Accountant, or through this link. How do I unlock more benefits? The higher your tier, the more benefits you unlock. Continue taking actions to earn points to get to the next level! For full details about how to earn, see our Firm of the Future blog. Can I request ideas for new benefits? We love your feedback! To request new benefits please log into QuickBooks Online Accountant, select the Gear icon on the top then Feedback.